Kyrgyzstan has declared Tuesday a day of mourning. Around 10pm local time a strong earthquake struck in the south of the country. Its epicentre was on the territory of neighbouring Tajikistan. The quake measured 6.6 on the Richter scale. In the capital of Kyrgyzstan, Bishkek, the shock reached four. Aftershocks have been felt in neighboring Uzbekistan and the northern provinces of China. The village of Nura has been almost completely destroyed. It is in one of Kyrgyzstan’s most remote regions with Osh the closest big town. The rescue force has been sent in, but broken roads mean reaching the victims has not been easy. Turatbek Dzhunushaliyev from the Kyrgyz Emergencies Ministry said they had sent forces to cope with the aftermath of the earthquake. “A temporary station has been set up and 35 rescuers are already working in the affected zone,” he informed. The Prime Minister of Kyrgyzstan has appealed to the United Nations for help. The UN Development Programme is providing blankets, tents, food and other necessities from its warehouses in the country. 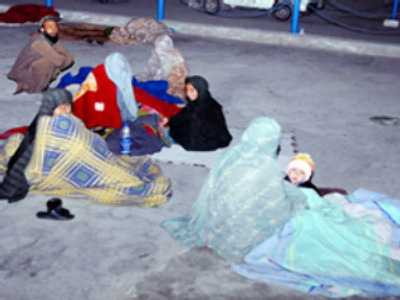 Provision of blankets and other protection against the cols is most important as temperatures in the town of Osh are just 8 degrees Centigrade and winter is just around the corner. According to the Kyrgyz authorities people in the affected region will get around $US 5,700 compensation for the reconstruction of their homes. Financial aid will also be given to the families of those who died in the quake. Russia's President Medvedev has sent his condolences to the victims' relatives and has asked the country's Emergencies Ministry to help deal with the aftermath. Russia has sent a plane with humanitarian aid to the country.